Youth involvement in Philippine politics is still somewhat limited. One of the reasons is the weakness of political parties, which in turn often do not have strong youth wings that offer young people an attractive entry point into politics. This ultimately limits participative democracy in the country. 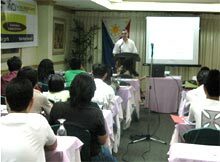 How to address this issue was the burning question at the Institute for Popular Democracy and the National Democratic Institute for International Affairs forum “How Political Parties Can Attract the Youth” on 3 May 2007 at Sulo Hotel, Quezon City. The morning was devoted to inputs from speakers: Dr. Joel Rocamora spoke on “The State of Philippine Political Parties and the Extent of Youth Participation,” Mr. Norman Patino shared “Experiences of Building Youth Wings of Political Parties in the Philippines” and Friedrich Naumann Foundation Representative Siegfried Herzog looked at “Examples of Building Youth Wings of Political Parties in Other Countries.” The afternoon was devoted to topical workshops aimed at discussing practical steps to increase youth involvement in politics. Herzog explained how the task of youth wings is to allow new ideas and new talents to come up. It does this by giving the youth representation in the political sphere, by helping the party reach out to young voters and by giving young people a chance to engage in policy debate and activism. Youth wings also assist young people in developing skills and networks that will help them in their careers. With its young and growing population, the Philippines is a democracy where the youth can play a pivotal role in politics. The growing urbanization will probably strengthen the demand for modern democratic governance. Parties with a strong youth wing will have a crucial advantage in the years to come.